In the most florid criticism I can recall a network "correspondent" leveling at a major party presidential candidate, MSNBC's David Shuster has branded Rep. Tom Tancredo (R-Colo.) a border-control "fanatic." 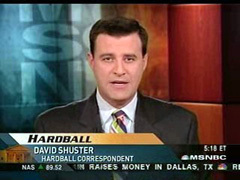 The editorializing came in the course of Shuster's report during today's 5 PM ET "Hardball," which included an update on the GOP primary. DAVID SHUSTER: No television commercial in Iowa is generating as much heat as the one just unveiled by Republican Tom Tancredo, a border-control fanatic. Shuster proceeded to play the Tancredo ad, which can be seen, along with Shuster's "fanatic" comment, in the video linked above. A higher-quality video version of the ad is available at Tancredo's website. There's no doubt that the tone and certain of the images contained in the ad are dramatic. People will draw their own conclusions as to whether the ad crosses the line. But let's look at Tancredo's actual proposals for immigration and border policy as laid out in the press release accompanying his ad. put the military on the border if necessary, to keep them from coming back. And if Tancredo is a fanatic, how would you describe those who would wink at border security, grant amnesty to millions of illegal immigrants, and grant them driver's licenses and other documents that might permit them to register to vote? For that matter, what word would apply to a "correspondent" who injects his own political opinions in this manner into his reports? TUCKER CARLSON: Now, I look at that ad, and people are appalled by that ad: "it's disgusting, it's over the top." I think that ad is totally defensible I love that ad. I think it's kind of true.